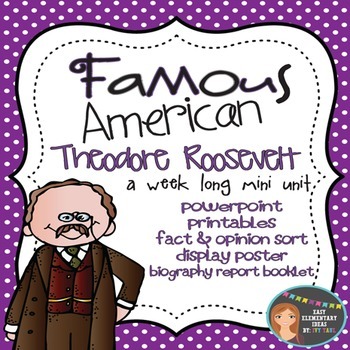 This is a weeklong unit on Famous American Theodore Roosevelt! 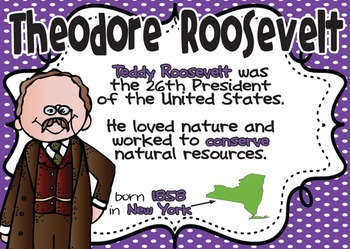 Unit covers Theodore Roosevelt as a "Rough Rider", the 26th President of the United States, as well as his work with conservation of the environment and creating National Parks. 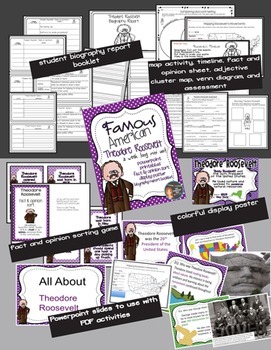 Students will compare and contrast their life to Theodore Roosevelt’s , cut & paste Theodore Roosevelt timeline activity, describe Theodore Roosevelt using character traits, write a mini biography report on Theodore Roosevelt, and more! What locations are significant to Theodore Roosevelt? 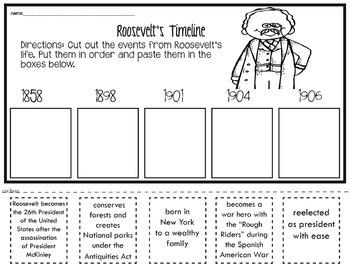 What character traits describe Theodore Roosevelt?